In our previous posts, we’ve outlined the various dentistry services that our clients have come to rely on in the Orlando area. Preventative dental services like dental cleanings, correct occlusion, and an uncompromising commitment to quality materials and tools were highlighted. We also looked at restorative dental services that Dr. Ali Behzadi, DMD, and his staff are happy to provide. These include metal-free fillings (nothing toxic), crowns and bridges, as well as inlays and onlays, which enhances the structure of your dental makeup. Not to be outdone, we also offer Botox® treatment, dental implants, veneers, teeth whitening services, and other cosmetic dentistry services that Your Downtown Dentistry is proud to provide with excellence and care. 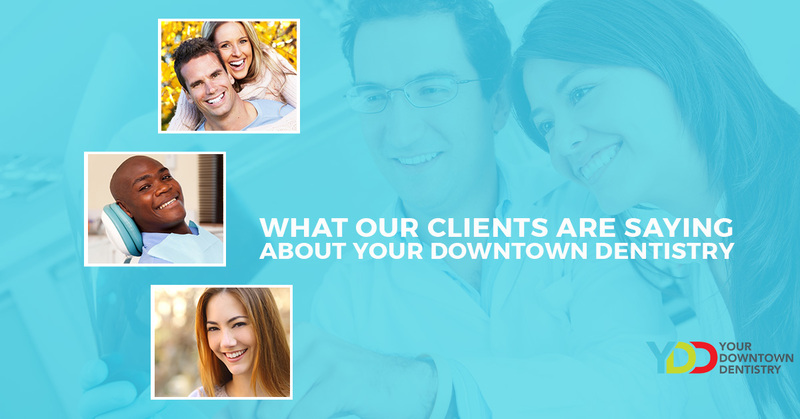 Today’s post is going to look at what you, our clients, are saying about your experience when you come into Your Downtown Dentistry and receive our care. We would like to take this opportunity to explore and share the many positives, because it is understood that we could easily go on ad-nauseam about our commitment to serve our Orlando community. It simply holds more weight when it comes from someone who is, perhaps, like yourself. If you are searching for anything from gum disease treatment to emergency dental care, read on because choosing the right dentist is a significant decision. Thank you for your kind words Bernadette! One of the areas of expertise which we have yet to mention is that we are Orlando’s number one choice as a dentist for kids. If you are looking for pediatric dentist, this review points to the principle that we care about our clients, whether they are adults or children. Your children are more than just another client, in fact, because often we get the opportunity to introduce a child to the world of dentistry. This can be a scary threshold to cross, for some, so we do our best to make sure all of the children who we assist feel as comfortable and secure as possible. This review ties in so well with the previous one, so thank you for your kind words Nadine. Word of mouth is the best form of marketing, no doubt, but in order to get people talking, you need to go above and beyond expectations to make a positive impact. As can be observed from Nadine’s testimonial, we create a calming environment so that children and adults alike can rest easy during what can be a sometimes challenging experience. Our commitment is to blend our dental expertise with the hospitality and consideration that an Orlando, FL dental office should have. One of the hallmarks of Your Downtown Dentistry is that we will tell you our professional opinion in a forthright manner. If there is a situation where a traditional treatment may not be in the best interest of a patient, Dr. Behzadi and his staff will always put the health and comfort first. With open communication, it is easy to understand why this is downtown Orlando’s Top Rated Local family dentistry. Thanks Pat, we appreciate you taking the time to let us know how your experience was. It’s nice to see the commonality of great experiences across the board, for adults and children alike. And although we can’t guarantee that every appointment will be as punctual as Pat and their daughter’s, we can tell you that we take your time seriously. Often times our clients have had to take time off of work and still need to return. That is a sacrifice which we understand, so we make a point to be as timely and considerate as possible. Dr. Ali sees the big picture, along with the minute inner-workings of your teeth and oral health. As Greg has attested, our staff will provide you with professional recommendations for your oral health and how it relates to your insurance and payment structure. Greg makes a great point that this is more of an exception than a rule for dentists across the country. Let’s and today’s post with a short and sweet one. Your Downtown Dentistry is the top family dentist of Orlando not by coincidence. We are intentional about everything we do, because we know that no matter how big or small the task (or patient) is, our goal is to make your day better in any way we can. Whether we can help you with a friendly smile or, heaven forbid, a root canal treatment, we want to do so as best we can. We are open from 9am-5pm on Monday through Thursday, and Fridays by appointment. Get in touch with us today!